Here is the gross rental yield calculator. Use this calculator to quickly and easily calculate the gross rental yield of any property. Simply enter the purchase price of the property and the weekly rent and it will automatically calculate the gross rental yield for you. Does It Pass The Quick Test? If a property is over 10.4% rental yield it passes what is known as “The Quick Test”. This is also known as “The 11-Second Rule” which was made famous by Steve McKnight in his book 0-130 Properties in 3.5 Years. This occurs when the weekly rent of the property is double the price of the property (divided by 1,000). Gross rental yield is calculated by taking the purchase price (or value) of a property and dividing it by the annual rental income. Saving My House Deposit Calculator – Easily calculate how much you will need to save each month, week or day to achieve your savings target. 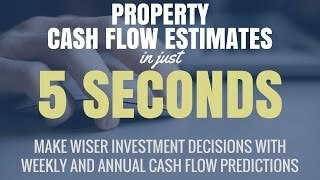 There are a few tools out there for calculating the cash flow of your property effectively. Most are quite expensive and hard to use. That why I created Property Tools. A online calculator that allows you to quickly and easily estimate the cash flow of any property in seconds. Simply enter purchase price and rental income to get an initial estimate, and then go into more details on each expense item to get a more accurate result.